Right now, any of my students under age 15 are invited. My youngest private students are 4, so this makes for a very wide range of ages! Eventually, my goal would be to split them into groups by age/level, but for now, I am just happy to give them some kind of group lessons. I am keeping them very fun and informal. Our first one was a back-to-piano pizza party last month, and I completely forgot to blog about it. Oops! :) I’ll tell you about it now. We played a Rhythm Memory Name Game. Each student creates a short rhythm example that will serve as their names. Students then “call” each other by clapping their own name, saying “calls,” and then clapping the name of another student. We played Rhythm Hopscotch (game idea by Sheryl Welles) in order to review the names/symbols of the basic rhythm values. We listened to a few students perform pieces. 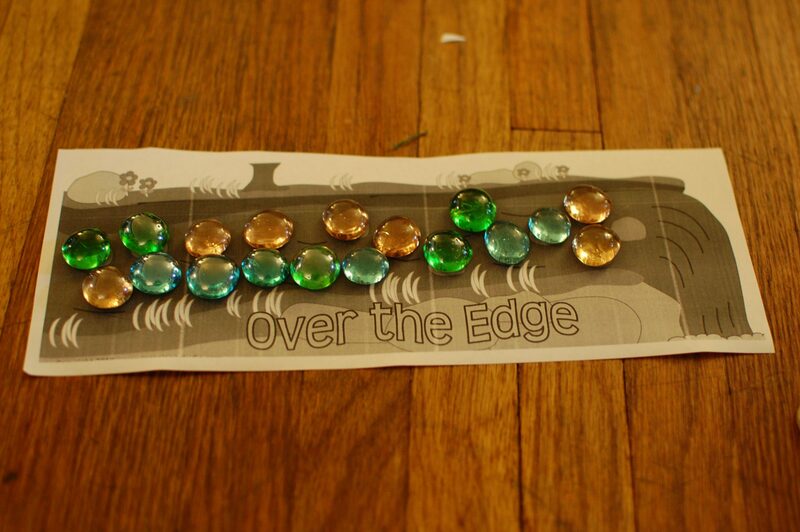 We played the Over The Edge game (pictured above), which is a fabulous game by Jennifer Fink from pianimation.com. To finish, we crafted a mini paper piano. I printed the blank templates, and we colored them ourselves with crayons (the one I made is pictured on the right). At group classes or music camps, I always make sure to give students some kind of worksheet or something to take home that day — which is what this paper piano project accomplished! Our next piano party for October is tomorrow, and my plan is to do a composer lapbook study with them along with one or two games. It’s great that the lapbooks are so flexible. I won’t have to worry about the leveling of the lesson — students will absorb as much information as they are able to! So, that is one of my latest projects — figuring out how to work group lessons. :) If you have any suggestions or ideas about running group lessons, please share! I would love to hear them! P.S. – Today is the last day to enter the EasyScales giveaway! Please leave your comment before midnight tonight (EST). The winners will be announced tomorrow. Do you charge for your piano parties? How long do they last? I usually start group lessons with a short starter activity at the table as the students arrive. Some of the worksheets on Susan Paradis, Making Music Fun Word Searches, or Pianimation are great because they can be completed quickly and I can vary the levels according to my student’s abilities. Musical Jenga is another fun way to start because students can join the game as they arrive. We had fun using your musical headbands idea a few months ago! Middle: I like to introduce a few new concepts each time & then play a lot of games to reinforce it. I also have a wide age range of students, so sometimes it is helpful to divide them into 2 groups so they can play games more catered to their abilities. This month to determine the order of performances (which seems to be REALLY important to some of them :) I had them pick a music alphabet card and then perform in the order of the lines on the staff. That’s a great idea to have something ready for them to do as the other students arrive. I tried out your advice and set out my Musical Jenga game on Friday before the students arrived. They loved it! Thanks a lot for your other tips, too, Heidi! Great ideas! We hold Performance Classes about every six to eight weeks. Students perform and critique each other. We call the critiques “valentines” — given in love and meant to be an encouragement. Our first few classes were designed to teach the children how to “criticize” in a positive and helpful way. I have found that when the children learn to listen objectively, they also learn to listen critically to themselves. We focus on some kind of theme. We start with a game, then play the pieces, and end with refreshments. Performance classes replace the lessons for that week. Parents may attend, but we do not invite the public. One class we called “In the Mood”. Students were to try to convey a specific feeling when they played their piece. Then the other students tried to identify the mood. If they failed to get it, they made suggestions to the performer as to how he might have done a better job expressing that feeling. During the Olympics, we gave each student cards numbered 1 to 5. After each performance, they held up a card with a number displaying their evaluation of the performance. To keep this from being too harsh, we instructed the students that a 5 meant absolutely perfect and a 1 meant that the student couldn’t play the piece at all. If they gave a score less than 4, they had to tell why. Students also held up a card for themselves. Most of them were harder on themselves than they were on each other. In November, we are having an election. We are electing a Baroque Boss, a Classical Captain, a Romantic Ruler and a Modern Monarch. Students have chosen a composer from one of those eras and will “campaign” by playing his music and telling something interesting about him. They will vote on a Composer Commander-in-Chief from each period. There is no better pedagogical approach than private tutoring. But an occasional group event is very helpful for adding a social element to an otherwise solitary endeavor. It adds variety and provides support and encouragement from someone other than than parents and the teacher. Looking forward to seeing everyone’s comments! Joy, you and the other teachers inspire me! I started following your blog last spring and have changed some of my teaching because of your ideas. My students are having so much more fun and so am I! Thanks for the great ideas, everyone! I started Group Lessons two years ago. It was the best thing that happened to my students since they come from 4 counties. Many do not know other piano students so it helps with the isolation/self-esteem. I have a least 2 classes each semester. During the week of Group, I do not teach private lessons which I plan so that I may fulfill other obligations. I try to fit it in a month that has 5 weeks in it. My lessons are thematic with the holiday season. I always have a worksheet (usually from Susan Paradis/ usually note reading) available while everyone arrives or do any individual game like Music Wrap-ups. We always perform for each other one piece because many do not play for audiences. This helps with recital jitters as well. I then cover a composer with worksheet or an orchestral instrument. We play a couple of games. We have a snack. Group lesson day is also half-price day at the music store! Many save their music money for that day. This past week was group lesson day. I had one for the jr. high and high school students and then another class for elementary students. We watched a short video on how Steinways were built. The older students I covered a couple points from Rules of the Piano to help them play more musically. The younger class we used Joy’s orchestra and colored them and used flashcards to determine if they usually perform in the orchestra. Attendance is required. Thanks for all your ideas, Donna. I’m curious — how do you enforce your required attendance policy? Do parents/students ever resist it, or do you find that they are cooperative in making it a priority? It is hard to enforce. But I just let them know up front this is required. I schedule the group lesson based on their extracurricular activities form that I had them fill out at the beginning of the semester. I just tell the parents it is like getting three lessons for one deal! My parents and students are frequently asking when is the next group lesson! Once the student comes one time – they don’t want to miss! Of all my students, only one did not come to group lesson last week due to a sporting obligation. My music education background/teaching experience and my children’s Kindermusik classes helped me tremendously to plan these lessons and make them fun but cover some necessary elements that is so hard to do in a 30 minute lesson. Most students here do not have music in the schools with the exception of jr. & high school band. So group lessons are a rare jewel! As an MYC teacher, I teach group lessons as my main form of teaching. Both parents and children learn together weekly in an environment which encompasses a lot of what you do with your piano parties. I’m in my 9th year of teaching and have found that kids can be engaged in music in many different ways. By having them come together as a group, we are able to experience music not only by playing the piano together, but by playing rhythm instruments as a group, singing as a group, dancing and playing games. The time flies by and the kids have fun. I could never picture group lessons until I started to teach them myself. It’s a great way to learn. I think it also shows that as a teacher you have decided to do more for your students then a lot of teachers would. Agreed – there are many different benefits to using group teaching! Are you planning to post your activities/lesson plans for the October group class? I would love to see what you chose to do. Also, how much cutting do you do ahead of time for the composer lapbooks? I’m afraid if I left all the cutting up to them, it would take forever. What have you found that works? I let students do all the cutting. To prevent the composer study from taking up too much time, I let them color the composer picture (and start cutting some of the other pages if they finish that) while I read the biography aloud. I also play all the musical excerpts as they work. If the 5- and 6-year-olds get behind, I help them cut for a while to get them caught up with the others. I will admit that there is a lot of cutting involved, but I think it is worth it for the end product! It is definitely possible to complete a lapbook study in 45 minutes with a class if that is what you would like. You could certainly cut out the pages in advance, but it would of course take a lot of time for one person to do that! I’m trying to renovate my studio with something like this. I think I am going to start with duets! I noticed that you called it a back to piano pizza party….did you order pizza for all your students? And did you hold it right after starting back to lessons or a few weeks into September? I try to hold a group lesson every other month and love this idea to kick things off again in the fall! Yes, I kicked off the school year last fall with a pizza party, which was fun! I held it the first Saturday in September. Great idea! I’ve done an ice cream sundae party for my June group lesson as the wrap up for the year, spending most of the hour with games and performances in a format very similar to your piano parties and then the last 15 minutes we head out into the yard to make ice cream sundaes. It’s been requested again for this year!